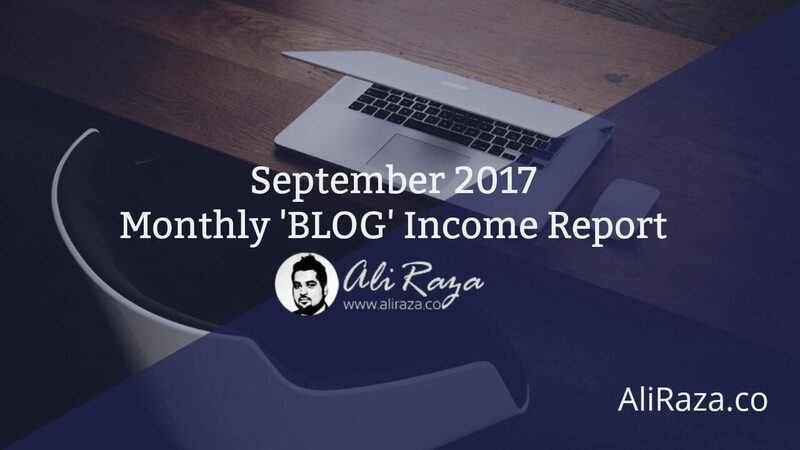 Welcome to the September Monthly Income Report for AliRaza.co. This is the 20th Monthly Progress Report of this Blog. The purpose of Monthly report is to review the amount of work I do every month, along with website, social media and subscribers statistics. In other words, I critique the performance of myself and my blog every month to see where i’m standing. 2 Posts Created In The Month of August & September, 2017. 4.1 Comparison with the Month of August 2017. 12 Plans for August 2017. This month, I got my Google Adwords Certification renewed for next year. I’m also in the process of setting up question and answer plugin for this site but it had some issues but i plan to initiate it till the end of october. You can see the rating marks, I added them via this All In One Schema.org Rich Snippets plugin and there are many more things you can do with this plugin to improve your site listing at Google. Hope to have more news here next month. Posts Created In The Month of August & September, 2017. From the last monthly report of July till September, I have added 7 new articles and updated 1 old article. How to Grow a Niche Blog (Even If You Don’t Know SEO)? Vlogging or Video blogging is a process of sharing life, event, or story in the video format through the internet. The term vlogging started becoming popular in 2010, especially along with the growth of video sharing site YouTube. In this guide, I will explain on how you can start your vlogging career! Are you going to start Vlogging in 2018? or are you inspired from a popular vlogger on youtube? And you are looking for best vlogging cameras to help you out? Why I Like My Personal Blog So Much? Have you ever wondered why I got serious about my personal blog? You might have noticed that I have been publishing content on a regular basis for, give or take, 2 years now. In this article, I have shared what I’ve seen, learned, and observed in this time duration. The Facebook marketing has been pretty much assumed as Facebook Ads, which is not the right way to describe. It does have a lot of things that brands need to understand. Does Your Business have any Digital Marketing Strategy? If not yet, then look out for these 3 EXCLUSIVE steps to start Digital Marketing for your Business! July 2017 was the regular monthly blog income report which was published in august. 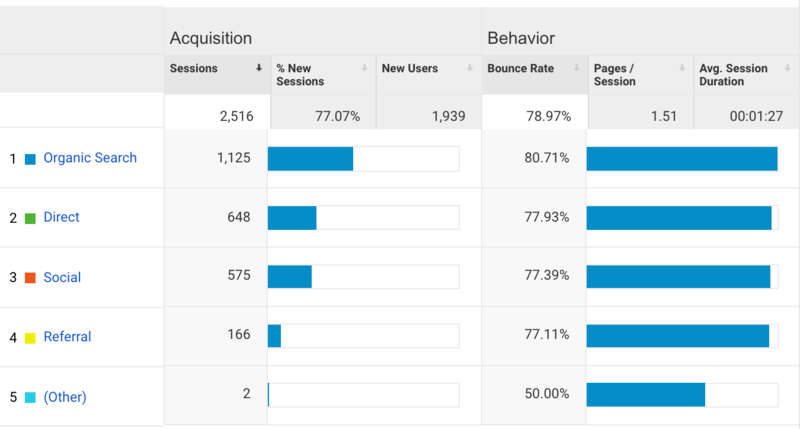 It takes an overview of where the blog is standing, what do people like the most, from where im getting more traffic and key strategies on how i can improve. This is an old guide which has received tremendous response so far, if you don’t know yet, it’s a complete A to Z Guide on How You can start making money from fiverr platform. 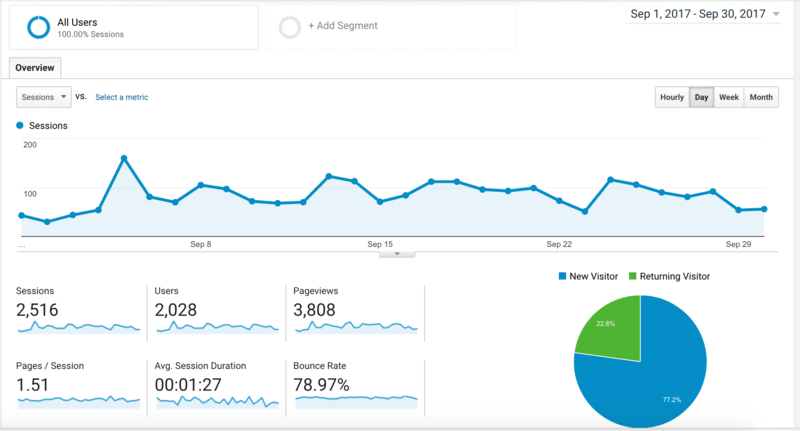 Here are the traffic stats for the Month of September, I received a total of 2028 number of unique visitors, 2516 Sessions and 3808 Page Views. Let’s have a look on the traffic sources to get an idea on what are the top traffic acquisition sources for this blog in the month of September,2017. Comparison with the Month of August 2017. There is so much data to discuss this month, I have made bullet point for discussion. 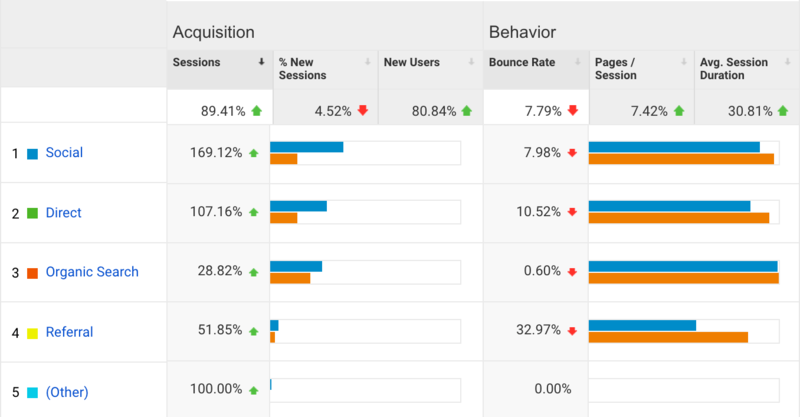 16% increase in overall traffic as compared to last month is not bad, it’s good. I also an huge 169% increase in social media and 28% in organic traffic which is a good move, but i also need to tell you that before this, I was little in active on social media about my website and now i started working again there. 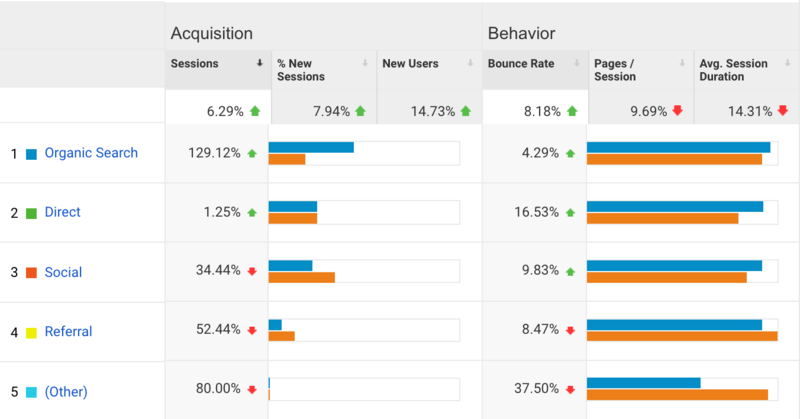 If you compare the data with last year, it’s just 6.29% increase in sessions but if you look on traffic acquisition channels, organic traffic has an huge increase with 129% which means the blog is getting more authority and love from Google. One of the best month so far in this year. How To Make Money from Fiverr came to second and there is a strong reason to it, and yes i added heavy content in it. My article about Best Vlogging Camera came at third and it’s good achievement! Do you want to learn about 100 finest ways to make money online for free? my article covers in depth review for each of them. Below are the updated stats till 30th September 2017. Overall, a total of 6909 people are following me over social media except the following on my person facebook account. However the bad thing is that the number of increased people is very less and i need to focus on this to improve. Let’s have a look on the traffic I received from Social Media Traffic, last month in September. Facebook has always been a constant performer and generating top traffic from me, usually it was sending me 90% of total traffic but my latest tweakings at Quora is also helping me. Quora came on third, thanks to some efforts of developing a profile and building links there with good answers. In August and September, I was being mentioned at two different places. Firstly, I was mentioned by Ahmad in his roundup about, 30+ Experts Share What’s the Perfect Time to Start Link Building for a New Blog? Thanks Ahmad for the gesture! Then, it was Hassaan Khan, who mentioned me in his post, How I get Freelancing clients with 4 simple rules, it’s a great post, I must appreciate him and thanks again Hassaan for the mention! 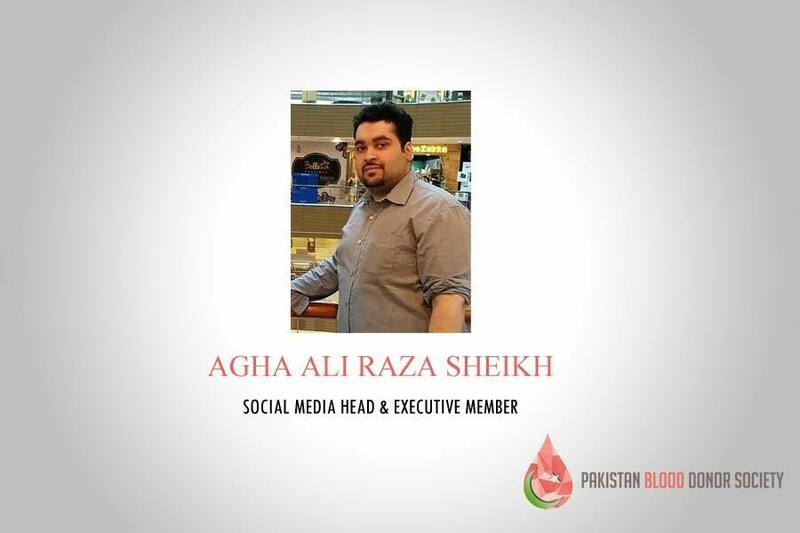 Then I was mentioned at Adeel Sami’s blog in his roundup, The Best Blogging Reading Roundup Post for Week 31 & 32, Thanks Adeel for recommending me in your blog, i really appreciate. Lastly, I was being mentioned by Praveen, in his latest roundup about 66 experts share their favourite blogging tools! Thanks Praveen for adding my point of view! Good luck with your blog. I also take part in some social activities and at the moment, I’m working with Pakistan Blood Donor Society to give back to the community, i know it’s not much but still something is better than doing nothing at all, isn’t it? 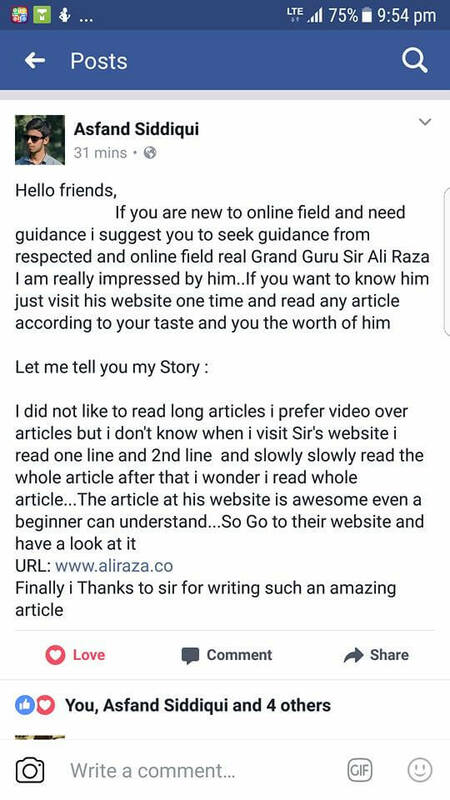 I was also appreciated by my long time reader Asfand, Thanks I appreciate. Finally, SEO services are available on this blog. These services were supposed to be launched few months ago but it was postponed due to to some reasons, but in anyway it’s a good news that they are finally available now. At the moment, there are two packages available. This package is basically for starters and small business. The package is available for $125 for recurring time. You can check more details on the package by clicking below. Click to Check SEO Small Business Package. This package is usually for Medium to Small Business’es. It may varies according to the competition of the keyword. You can check more details on the package by clicking below. Click to Check SEO Medium Business Package. Payments are accepted by Bank Transfer, Wire Transfer, Skrill, Payza, Payoneer, Bitcoin, Western Union and Paypal. Please note that once these services are ordered there is no refund option. We usually over deliver the links from what we commit, so if any links isn’t online, the extra compensation may adjust for that. SEO Services which includes monthly packages and audit at the moment. Adwords/Bing/Facebook PPC Services which includes management, audit and setting up of campaigns. This month, consultation revenue were increased little bit and i earned $200 . Please keep in mind that I do have an online advertising agency as well but i keep their earnings separate even if that is of just consultancy. My Third Batch for Digital Marketing has been started and registrations are open for a very very limited time! For those who don’t know, I’m doing two type of online trainings at the moment. This month, I spent $5 on Picmonkey and $130 on site expenditures. I plan to write 5 new posts this month. I want 1200 organic visitors this month. I want to generate business for my SEO services through this blog. I want to run the Question and Answer Session on this website. I wanted to write 4 more posts, thankfully i did. 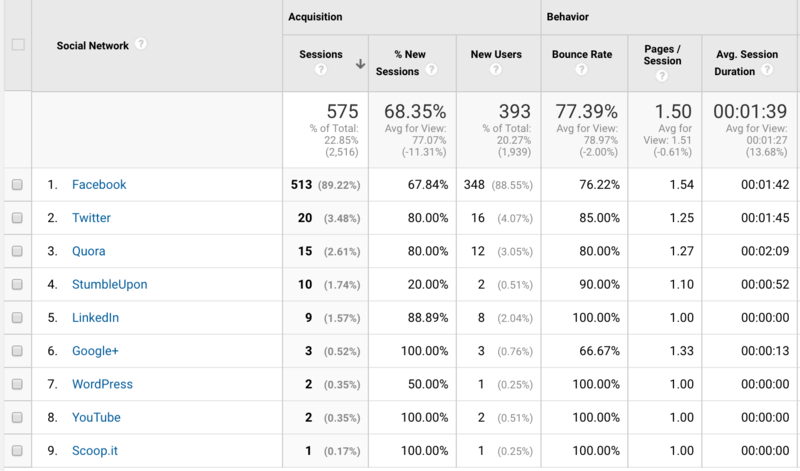 I wanted to cross 1000 organic visitors, thankfully i crossed the number. Well, i wanted to generate more business for my SEO services via this blog but still I’m looking for clients. Anyway, Thanks for reading my September 2017 report, hope it was a good read for you. Few metrics are missing as compared to usual report, but things will go good with the next month report, stay tuned for that. As always, I’m open to criticism, what are your thoughts on my blogging strategy? Did i miss something? What do you want me to add in my monthly reports article? Every appraisal and criticism is welcome here, please do comment on what you think. So what are you waiting for? $837 isn’t a bad earning from a blog and that too, in your part time efforts, So If you are interested in starting a blog for your own or you want to have an online presence, or you as a company want’s to engage your audience with a blog, why don’t you have a look on my tutorial for a complete blogging series which will help you to start your blog in just 15 minutes for a fairly cheap price (the low price is only through my link), For your information, if you will buy 12 months of blog hosting via my Bluehost link you are going to get 1 free domain as well, and the cost is going to be dirt cheap at annual package and it’s fairly easy to earn money from blogging too if you have a self hosted blog and you know how to monetize it well, also if you have bought it from my link and still having troubles, then reach me for a FREE setup, Good luck! Ali, Thanks for sharing your day by day performance. Whenever i came here i got motivated and have some more motivation to achieve my Goals. Glad to know that I was some sort of motivation for you, best wishes and good luck for you and your blog. MashALLAH! Yet another great month you had! I am so sure you’re going to see the best growth in the coming time because you’re continuously experimenting the strategies. And you know with the experiments, we get to learn what’s not working and with the little tweaks, we start to see the working things. InshALLAH, see you pursuing the best progress! And I am so thankful to you mentioning me in this awesome post, JazakALLAH! Thank you so much for the appreciation, looking forward to break the barriers this month too. To all such people, we don’t want anything but just knowing your earnings for MOTIVATIONS. ONLY MOTIVATIONS. Ali Raza thanks for giving my motivation and I will try to earn like you then I will earn. Consider these earnings as motivation and you will one day cross this earnings, that’s the perfect answer to THEM! W.salam, Yes semrush is working great. Your’s welcome and glad to know that it was of some help in terms of motivation. Very informative and brilliant article. you are indeed a great source of inspiration and motivation for many peoples around this world. i must say that you are an institute in your self when it comes to internet world. Stay bless dear and keep rocking. Thanks Nasir and best wishes for you too.